Just when we think spring is here in more than just name, Old Man Winter sends us another blast of winter to put us in our places. Hopefully by the time this issue hits your mailbox spring will have come permanently with warmer temperatures, flowers and sunny days. Thank you to all who registered and attended the Northeast Leaders Conference in March. This issue comes out just at the time the conference is going on so we can’t tell you here how it went but we do know the workshops scheduled set this event apart from any recent Leaders Conference. More on the conference in the next issue. Also in March, I mailed letters to all Granges informing them of the decision of the Connecticut State Grange Board of Directors to sell the property located at 43 Naubuc Avenue, Glastonbury (formerly Good Will Grange Hall). This decision was made following months of deliberation and evaluation. In the end, it was decided the costs required to update the building to current code with handicap accessibility, adequate restrooms, updated kitchen, new heating and cooling, etc. would have been far too expensive. Use of the building would have continued to be for the Grange office and occasional use by the State Grange for gatherings and a monthly board meeting. It would have been difficult to justify. Following that vote, the Board instructed the State Master to arrange for a location for a new State Grange Office. A plan is presently being worked out and we will provide details when available. A letter was sent out to all Granges announcing the cancellation of the 2019 camping season at Camp Berger. Please contact the State Master if you have questions. Have your Grange and/or Grange members paid dues to your new Pomona? If not, please get in touch with your Pomona Secretary. On March 31, dues become payable to the State Grange for each of the three new Pomona Granges in the State. Unfortunately, there are a number of Granges who have not responded to the Pomona Secretary’s queries. It is important that a list of all current Pomona members in each Community Grange is provided to Pomona. The dues payment to the State Grange is based on the total number of Pomona members reported by each Community Grange to their respective Pomona Granges. 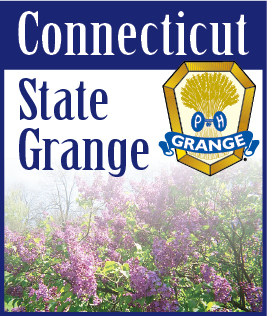 The State Grange continues to file the 990N ePostcard for all Granges in the state for 2019. HOWEVER, the IRS took down portions of the website in early March and have yet to put it back online. Agents at the IRS have absolutely no idea when the site will be put back online, so I wait, and wait... and wait more. It’s frustrating but there’s no alternative as all 990 filings must be done online. Rest assured, your Grange’s 990 will be filed by me as soon as I am able to log on to the site again. When the filings are complete and we have received acceptance from the IRS, receipts will be sent out to all Granges. Please place these receipts in a safe place as they are your only proof of filing and this can also be useful to your Grange when conducting financial transactions.